Do you feel anything, hummingbird? Art Nouveau in a celebration of original absurdist images and hummingbird transcendence, ESPESANTES by Stuart Ross and above/ground press. This work is inspired by Sarah Moses’ Chapbook in Spanish, As they say (Socios Fundadores, 2016). Stuart Ross (Poet, publisher, teacher) lives and works in Cobourg, Ontario. He runs the micropress, Proper Tales, in its 40th year of operation and was the Writer in Residence at Queen’s University (2010). He has authored 20 books, poetry, essays, fiction, numerable chapbooks and been published in journals. The cover has a very riveting picture of a hummingbird in black and white that suggests poetry, eagerly This Writer opens the book. The title of this Chapbook, ESPESANTES means thickeners in Spanish and so begins a revelry in absurdist images that spills across the page, a Poet raving at the sky. Perhaps influenced by nonsensical DaDaist forms, perhaps Absurdist Theatre, a protest at a hidden power struggle in the background, the discordant images are painful and perhaps an attempt at illumination of some dark violence. The words are sparse, pared in in very short Beat tradition beats. Each word considered, sure footed, of a Poet who has been writing for a longtime, a conversation with angels. As if written in mythos, a dialogue in illumination of angst and precepts of systemic violence. Perhaps a revelation of some great suffering the beginning poems exist in some Existential ad nauseum, a hard space, only to blossom at the end into a Transcendence that suggests positive change, giving hope. The image of the hummingbird throughout the work, a beautiful illumination. A Beat poetry progression in fantastical absurdist images that flies, a beautiful blue hummingbird bird. 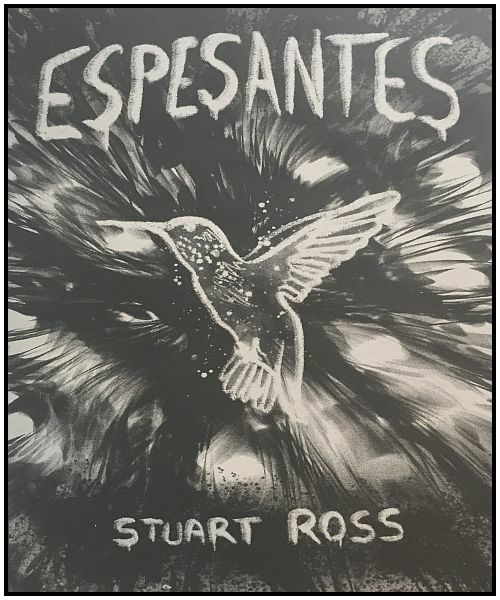 A great Canadian poetry offering, ESPESANTES by Stuart Ross.